A 22’ camper received moderate exterior damage after an electrical short started a fire outside of the unit. The camper is used by a man as a residence. The incident occurred at 10:46 at the Shuler’s Trailer Park located 11568 Jefferies Highway. The occupant used a garden hose to extinguish most of the fire before firefighters arrived. Click here for additional information. One man was critically injured and another received a non-life threatening injury in a double shooting incident that occurred at 1008 Proctor Street, the Chase Lounge, Wednesday evening 30-January. 9-1-1 Operators received the report at 21:43 advising of two people being shot in the parking lot of the local establishment. Click here for additional information. 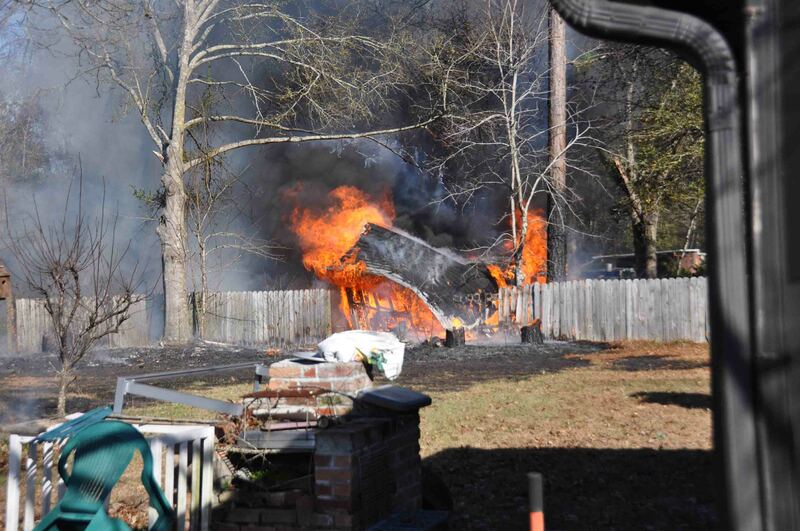 An unattended grass fire destroyed an unoccupied home on Hoover Lane near Lowcountry Highway at 15:06 Wednesday afternoon 30-Janaury. Firefighters were sent to the intersection after someone reported a house on fire near that location. Engine 7 arrived eight minutes later to find the wooden building completely burned down. Click here for additional information. 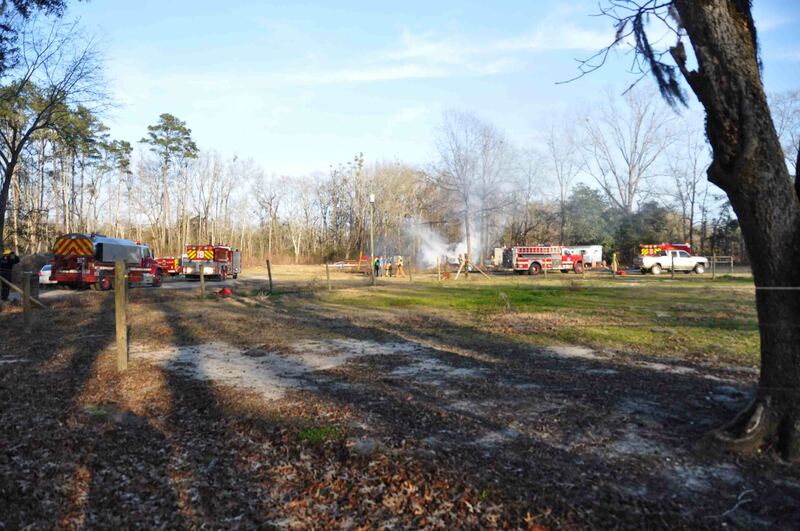 A grass fire spread to a structure at 11365 Cottageville Highway Sunday afternoon 27-January at 16:02. Engine 9 and Medic 9 arrived to find the small wooden building fully involved, endangering two other structures. Firefighters deployed two 1-3/4 handlines to protect the exposures and knocked down most of the fire in the building utilizing the deck gun. Several LP tanks were near the building. Click here for more information. Two of Colleton County’s new units were displayed at the Fire-Rescue East Conference held last week at Daytona Beach Florida. Two new ambulances and four fire trucks came off line at the manufacturers several weeks before the show and both manufacturers asked to show off one of the new units. 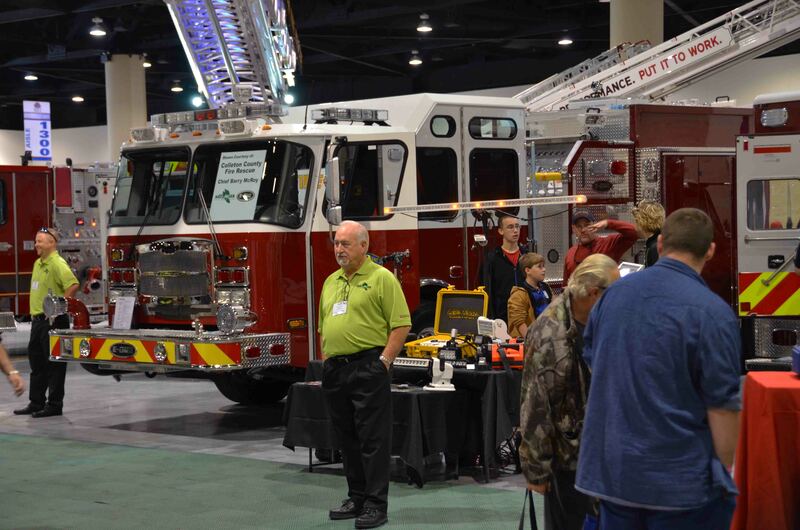 Emergency One (E-One) used several new Pumpers and Ladders in their booth...click here for more information. There will be an Emergency Services Softball Tournament March 9, 2013, held at the Colleton County Recreation Center at 280 Recreation Ln in Walterboro. The tournament fee will be $250 (sponsors are encouraged). The teams must consist of Fire, EMS, Police, Power and/or Phone Company personnel. Registration is due by March 1. To register a team, ask for more details or to play for Colleton County’s team, contact Brian Drew (843-909-3417) or Robbie McAlhaney (843-560-6187). All funds are split 50/50 between Carolina Children's Charity and MUSC's Burned Children's Fund. 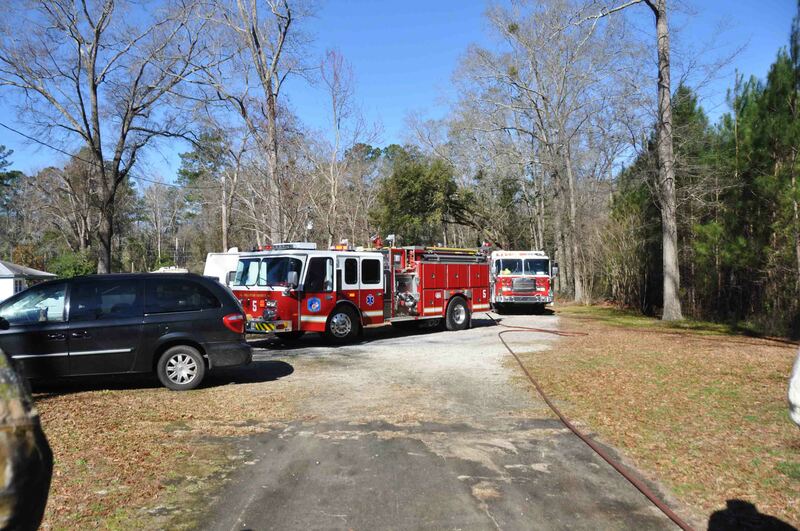 Colleton County Fire-Rescue was awarded a 2012 SAFER Grant and will be adding nine Firefighter-EMT positions to allow staffing for Fire Station # 13 in southern Colleton County. Interested parties may submit an application to any SC Works Office (Job Service) or contact the Colleton County SC Works Office at (843) 538-8980 and speak with Joyce Murray. Applicants should have an minimum of IFSAC Firefighter II and NREMT certifications, a good driving record and pass a pre-employment drug screening. Position is posted at $ 12.12 per hour. Full time employees receive the full county benefits package, State Police Officer’s Retirement System and paid In-Service Training. Colleton County is an equal opportunity employer. We wish to congratulate new grandparents, Firefighter-Paramedic Janet Laney and Firefighter-EMT Jeff Laney on the birth of their granddaughter Sophia Grace Phillips. Sohpie was born yesterday, 24-January. She weighed 7 pounds and 8 ounces and is 20 inches long. Sophie is the daughter of Janet’s son, Walterboro Public safety Officer Jared Phillips and his wife April. Both April and Sophie are doing fine. Janet is now doing fine too. 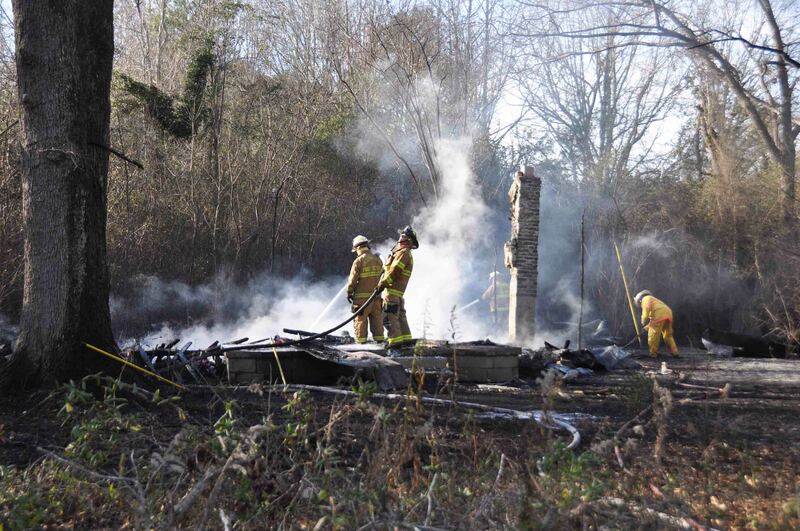 It with sadness that we report the death of Walterboro Firefighter Skip Lang’s wife. Stella Lang died Wednesday after a long illness. Skip was a long time volunteer with Colleton County until he took a full-time position with Walterboro. Walterboro Public Safety Chief Otis Rhodes is asking for donations to assist the family with funeral costs. They did not have insurance for this purpose. Anyone wishing to make a donation may forward the funds directly to Major Ken Dasen at Walterboro Public Safety on Hampton Street, forward it to Headquarters or give it to one of the Battalion Chiefs. A 20 year old man was critically injured in what witnesses reported as an accidental shooting at 200 State Street. 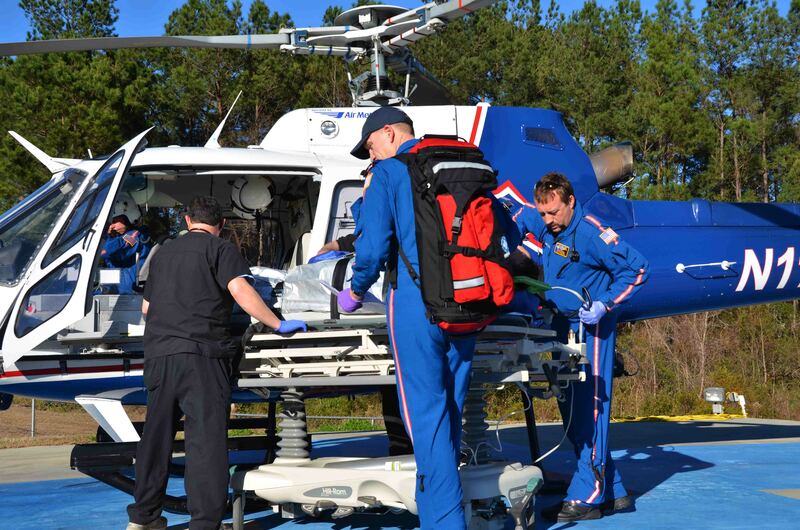 The incident was reported at 14:36 and occurred three blocks from Colleton Medical Center. 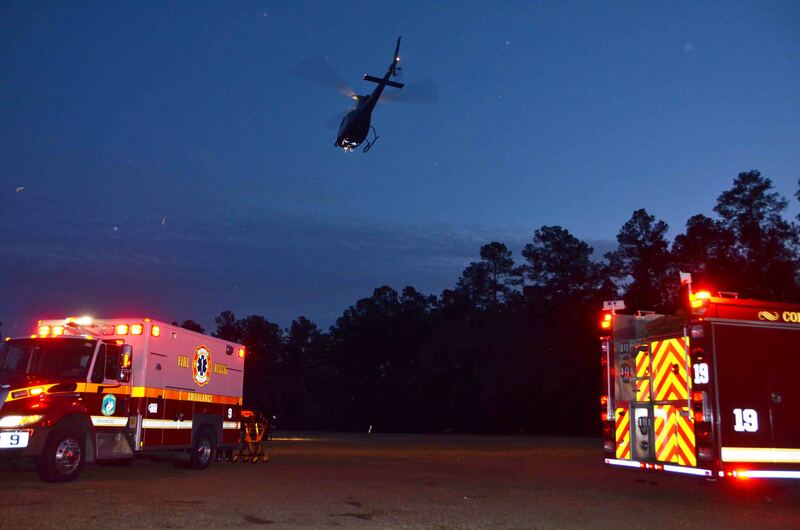 Walterboro Public Safety and Battalion 1 were on the scene within four minutes and Medic 6 responded from the ED. 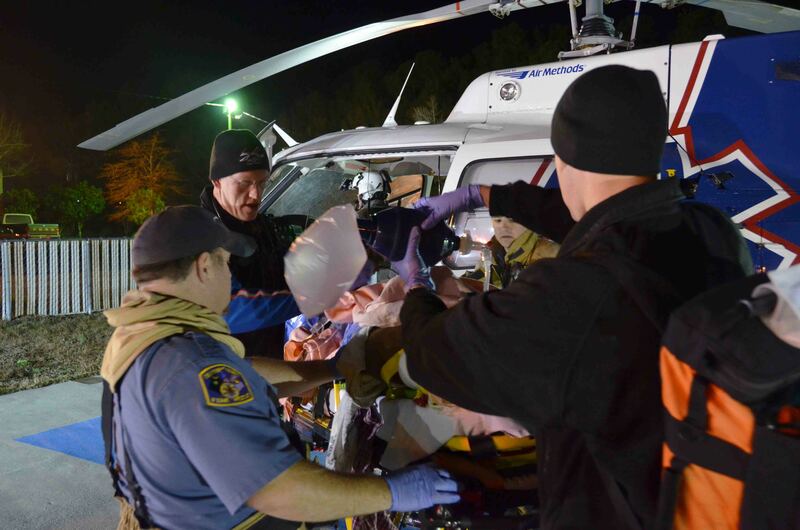 The man was struck in the upper chest at near point blank range...click here for more info. 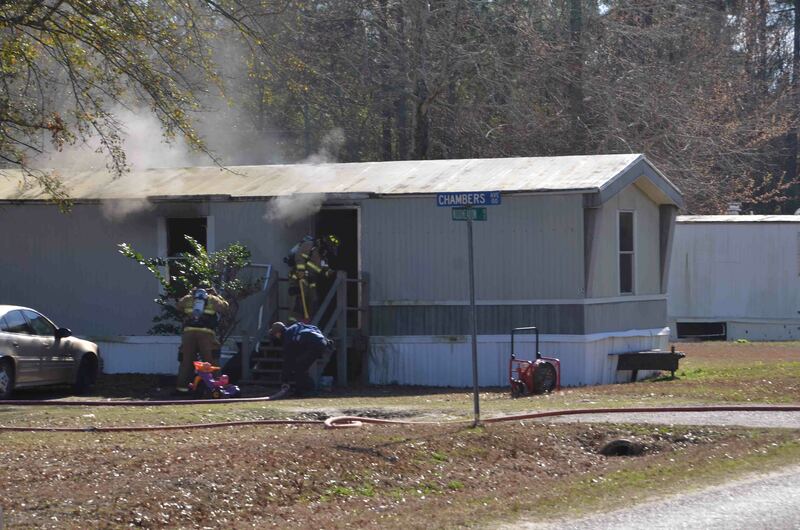 A mobile home was damaged in a mid day fire at 12 Chambers Street Sunday 20-January at 11:15. Engine 19 arrived to find light smoke coming from the singlewide mobile home at the corner of Chambers Street and Woodmeadow Drive. A neighbor reported seeing smoke coming from the building. 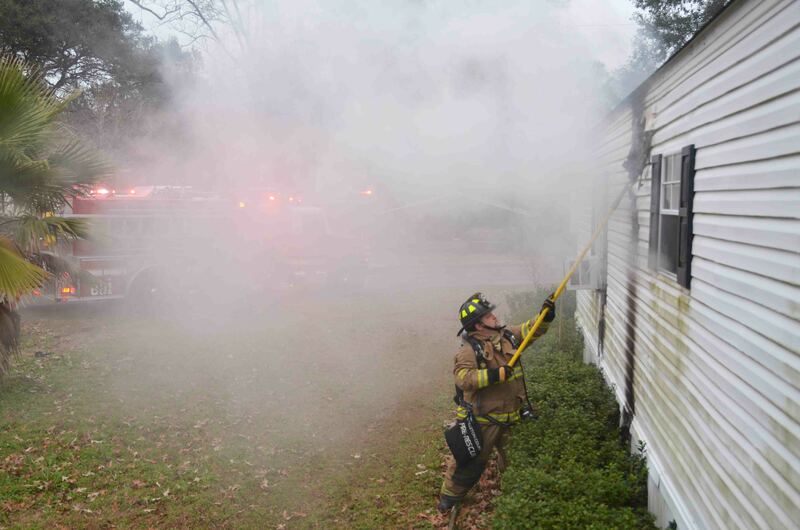 Firefighters made entry through the front door with one 1-3/4 handline... click here for additional information. High winds quickly spread a grass fire through a portion of a junk yard behind 1285 Nunuville Road Thursday afternoon 17-Janaury. At 13:15 9-1-1 received a report of the grass fire at this location with two vehicles involved. Before units arrived a second call reported a barn was on fire as well. A structural assignment was added to the incident. Click here for additional information. 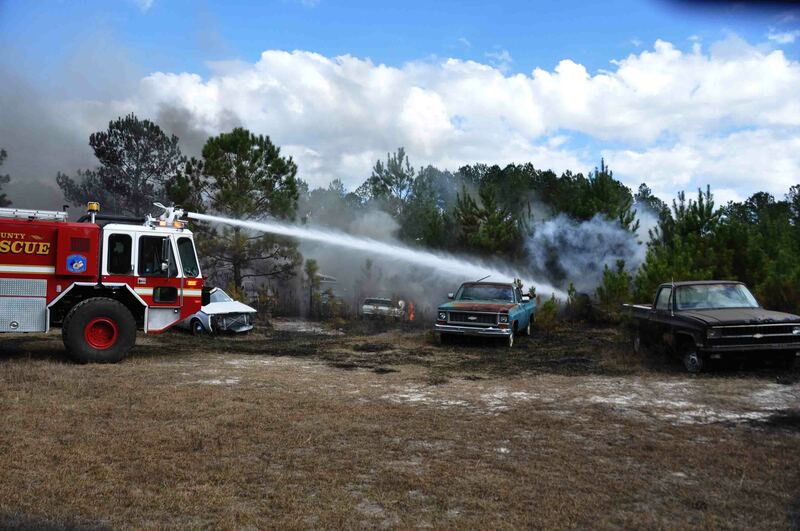 A rapidly moving grass fire, quickly escalated to a structure fire in the 500 block of Estates Drive Wednesday afternoon 16-January. At 13:56, 9-1-1 Operators received a report of a grass fire behind 580 Estates Drive. Within minutes of the initial dispatch, the resident called back to report the house was on fire and hung up the telephone. A structural assignment was added to the incident. Click here for more information. A single family dwelling was heavily damaged in a late night fire at 1447 Black Creek Road in the Hendersonville Community Monday evening 14-Janaury. 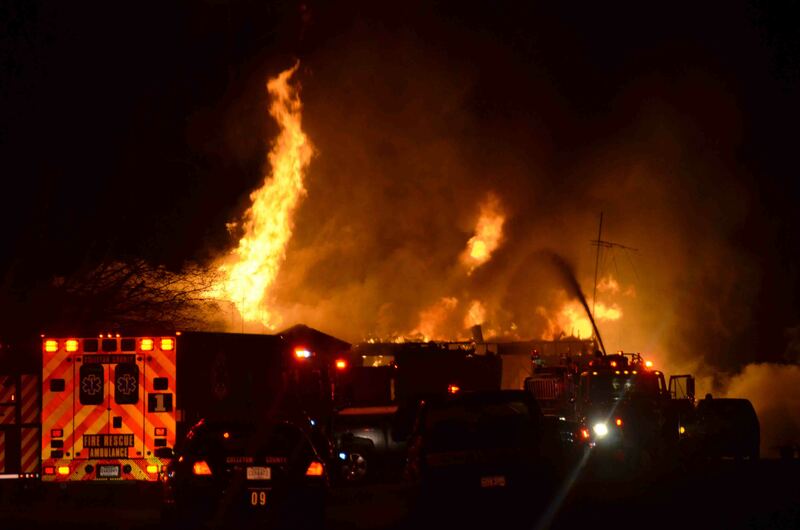 At 23:12, 9-1-1 Operators received several calls reporting flames coming from the residence. The home is located well off of the road down a long dirt driveway. Click here for additional information. Click here to view information on CCFR's new air monitoring equipment. 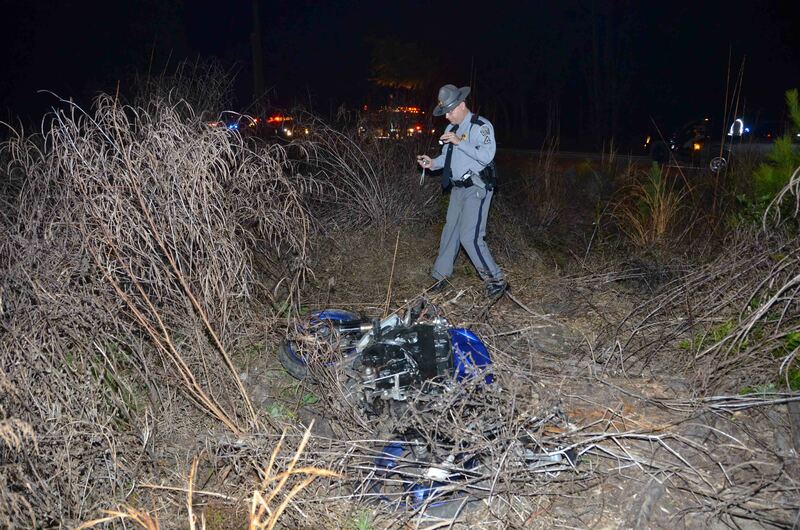 A 27 year old Jonesville man died in a high speed motorcycle accident Saturday evening 12-January. At 23:10, 9-1-1 was notified of the accident in the 900 block of Lowcountry Highway (US Hwy 21) approximately one mile north of Hendersonville Highway (US Hwy 17-A). The south bound Suzuki motorcycle failed to negotiate a curve. Click here for additional information. A 54 year old Canadys man suffered critical injuries in a single car MVC on Round O Road north of Harlequin Lane Friday afternoon 11-January at 17:18. As the north bound 1998 GMC pickup truck entered a curve, it left the roadway on the southbound side of the road. The truck overcorrected, spun around backwards as it crossed back to the northbound side of the road then struck several trees. Click here for more info. 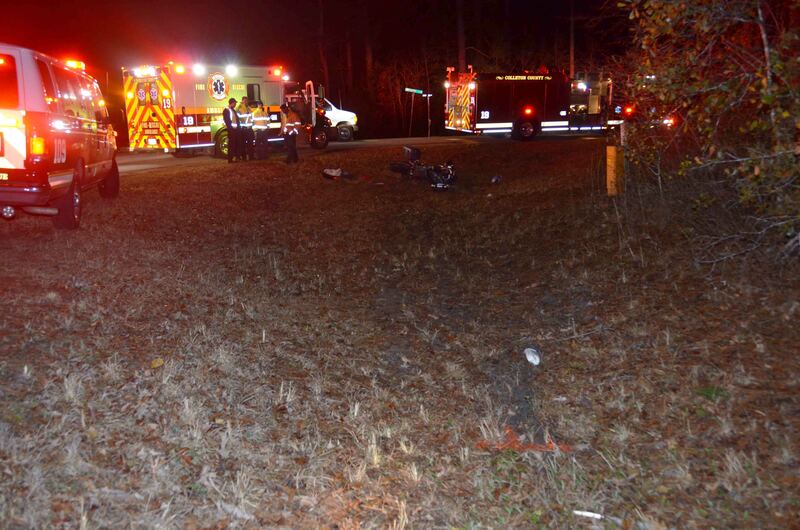 A 47 year old North Walterboro man died in an early morning motorcycle accident Tuesday 08-January. At 04:52, a Sheriff’s Deputy on patrol found the man and motorcycle about 15 feet from the roadway near the intersection of Jefferies Highway (US Hwy 15) and Burlington Road, five miles north of Walterboro. The man was found lying next to the motorcycle and did not have any signs of life. Click here for more info. It is with deepest sadness that I must inform you of the passing of Grover Volunteer Firefighter Richard Willis yesterday afternoon as a result of a motor vehicle accident. He was a member of Grover Fire Department as well as a full time firefighter with Santee Fire District. Richard is survived by his wife, Brandi, two daughters, Prisayus and Lahna, and step-son Tanner Parris. The viewing will be at Bryant Funeral Home in St. George on Wednesday, January 9th from 4PM to 8PM and the funeral will be on Thursday, January 10th at 2PM at the Indian Field United Methodist Church. The family is requesting a full honors, firefighter funeral. Any departments sending apparatus are asked to have their trucks meet at St. George Fire Station on Dutch Krakeel Road by 1:00PM. A single car MVC left one man in critical condition Saturday evening 05-January. 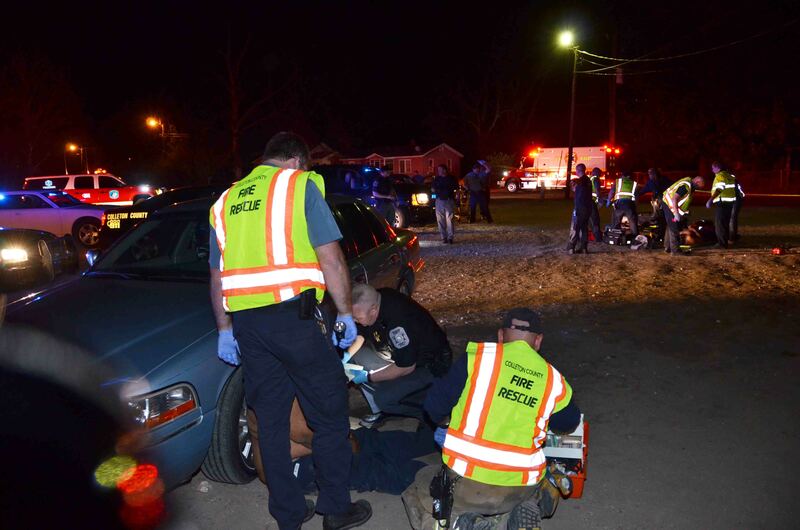 The accident occurred at 22:27 in the 4800 block of Sniders Highway (SC Hwy 63) near the intersection of Cane Street. A west bound pickup truck left the roadway at a high rate of speed, crossed the east bound lane and struck a power pole. Click here for additional information. A kitchen fire damaged a home at 275 Meadowlake Drive in the Hendersonville Community this morning 02-Janaury. At 07:25, Fire-Rescue was notified of the dwelling fire reporting a canine was still in the residence. Engine 8 arrived to find smoke coming from the eaves and several windows of the singlewide mobile home and flames visible from a vent in the area of the kitchen. Click here for additional information. We wish to offer condolences to the Kizer and Waldrop families. Ms. Mellissa Waldrop passed away at home this morning. Ms. Waldrop is the mother of ED Nursing Supervisor Samantha Kizer, who is married to Firefighter-EMT Dale Kizer. We will provide information on the funeral arrangements as we receive them. Please remember the family in your prayers. We want to congratulate Firefighter II Cody Hutto on the successful completion of the EMT Course. Mr. Hutto has completed his practical and written examinations and has received certification as a National Registry Emergency Medical Technician.